r business. If you can’t log in to http://docs.google.com with a user name/password, then you’re going to have to create one then move on to the next step. I want you to click on Create, then Form, then you’ll be taken to a totally different screen where you will be editing a form. 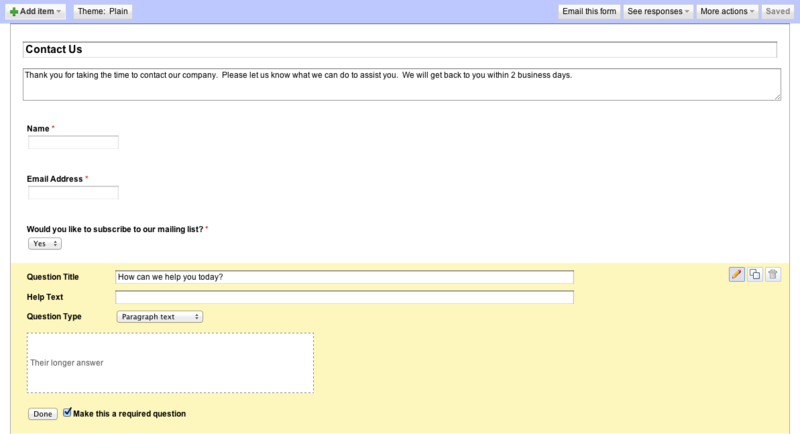 Here, you can name your form and include some welcome text with context as to what this form is going to be used for. You can tweak each “Question” with the pop up tools when you hover, and add items to your form by clicking the “+Add item” button in the top left. There’s also an option to change the theme to something more contemporary. Your choices are “Text, Paragraph text, Multiple choice, Checkboxes, Choose from a list, Scale or Grid.” You can make each question required or just leave that checkbox unchecked if you really don’t have a need for that question to be filled out. The multiple items you can place in your form give you a lot of creativity when it comes down to creating funnel questions if you are using this to ferret out leads. If you want to create a “Contact Us” form, however, I would stick to mostly text and paragraph text for your visitor to enter in extra content. This will now spit out a code for you to add to your website as an iFrame. Copy that snippet and let’s head on over to WordPress. Once you’re in your dashboard in WordPress, you should click over to Pages/Add New. Now even though you can just create a Contact Page with WordPress, by changing the Template on the right side of the screen to “Contact Page,” for this exercise’s sake, I’m going to make you click “Full Width Page.” and paste the snippet into the HTML interface. Then click “Publish” and check it out on your site! You may have to tweak the width and the height of the form, however I think that with the full-page option, it looks better than you’re going to get tweaking it around just to leave the sidebar. #payitfwd and leave a comment with a link to YOUR Google Document Contact Page.